The screenshot below shows you the main features in the interface. Tacking Time to Destination is one of the main functions sailors need, so it is always displayed in the center of the bottom bar. Your boat speed is shown in the bottom right corner in large letters. The speedometer icon on the bottom bar is for the wind speed, which you can click to enlarge. The Input and Options buttons are on the left side of the bottom bar, and will be described in more detail below. They let you set wind and destination information, and the kind of charts you want to display. The yellow sailboat icon on the chart is you. The red needle on the bow shows where you are headed. The grey arrow is the wind direction, which can swing around the boat depending on the wind direction. The crosshairs in the upper left corner of the screen allow you to move the map view around (when white), or keep the chart centered on your location while you move (when blue). Optimal tacks: these are the green lines. 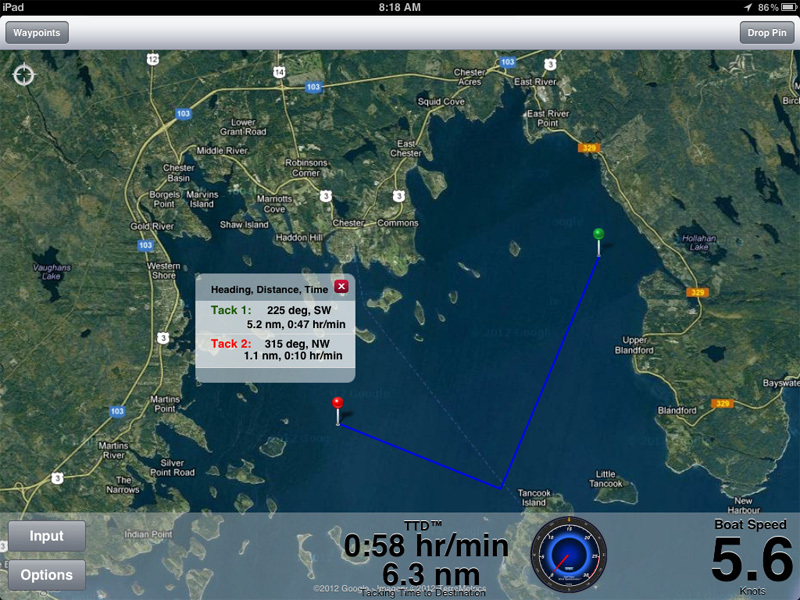 This is not just a map viewer; it is a powerful navigation tool for sailing. The blue line is your GPS track, which you can save and share. 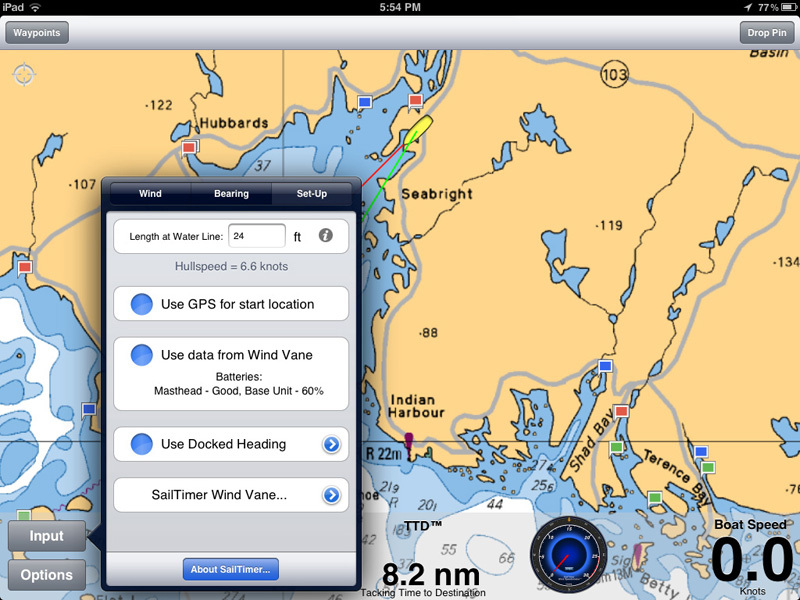 With version 5.6.2 in March 2015, we introduced a major advancement in sailboat navigation, changing the Waypoints button to a new Tacking Routes button. 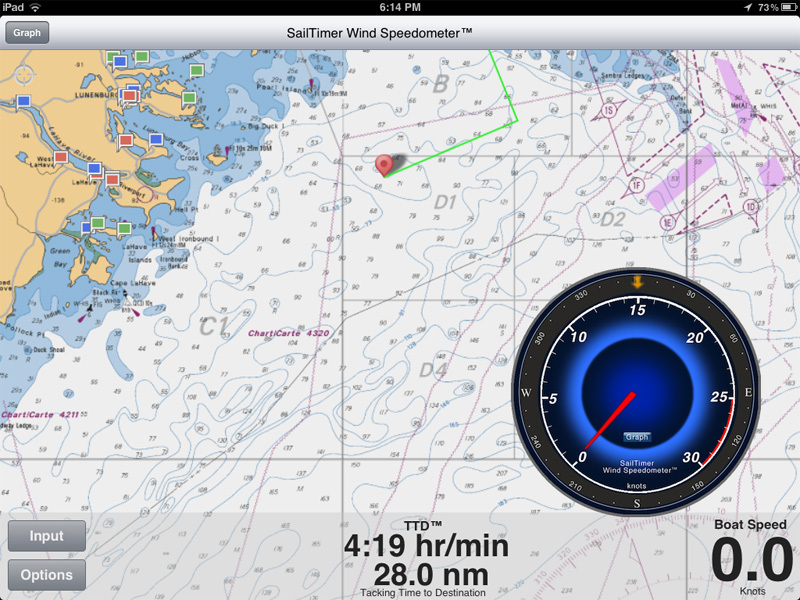 The SailTimer app (and Charts Edition) is the first app that can display your optimal tacks as a chart overlay with a multi-waypoint tacking route. Here is a screenshot. Now, if you are a racer you can paste in the list of lat/long coordinates for your race marks, and display your route around the course. Or for cruising or gunkholing, you can display the waypoints on your day's sail by either pasting in a list of coordinates or by dropping pins on the map for each waypoint. Then you can display your optimal tacks to the next waypoint, and see the TTD to get there (Tacking Time to Destination). You can also click on the waypoint and see a pop-up panel with the time, heading and distance for each individual tack (as in the second screenshot below). You can use the Tacking Routes button in the upper-left of the screen to enter one waypoint or multiple waypoints along a route. As with all app interfaces, it is designed to be pretty self-explanatory. Just click Tacking Routes, then New, and you'll see it says Tap on the map to drop a pin. Once you tap, another message comes up telling you to press the Set button, to set that waypoint. Then you can tap again to place a new waypoint, or press Save Route. Once you are displaying your optimal tacks for a tacking route, you'll notice a Next / Previous button slide up from the bottom of the screen. When you are getting close to the first waypoint and want to see the optimal tacks to the next waypoint, just press Next. Or press the Previous button to shift the tacking angles back to an earlier waypoint. This way, you can see the optimal tacks and TTD to any waypoint on the tacking route. For centuries, seafarers have had a dilemma when sailing upwind. Should you head more off the wind to gain speed (but at a longer distance), or head more upwind to reduce the distance (but at a slower speed)? The patented SailTimer calculations can easily display your optimal tacks, with a bit of information on the directions of the Wind and your Bearing (the direction to your destination). 1. Under the Input button, you can see the Wind panel below. 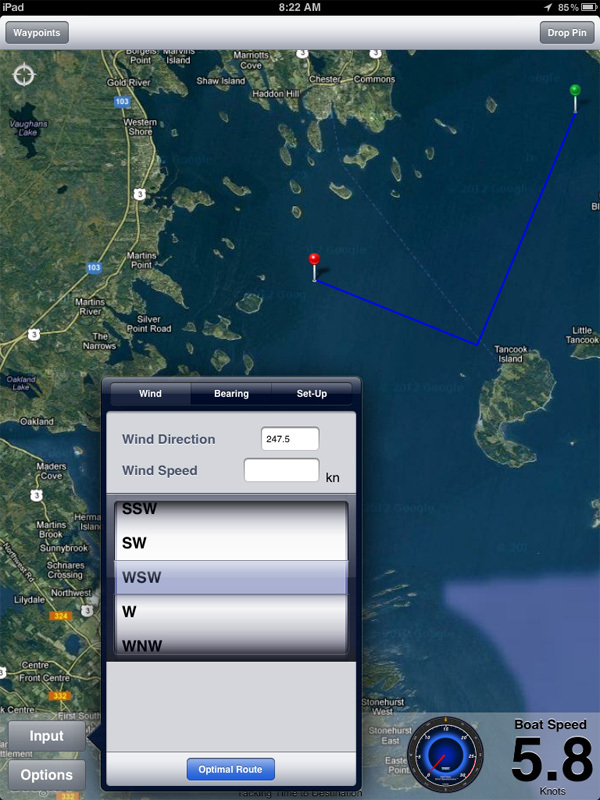 If you are using our wireless SailTimer Wind Instrument™, go to the Setup tab and turn on "Use wireless data". Then the tacking results change automatically as the wind changes). If you do not have a wireless Wind Instrument, you can also enter the wind direction and speed manually on the Input - Wind panel. (When entering manually, use true wind speed and direction, not apparent.) The large wheel is handy, but you could also manually enter the exact wind direction in degrees. The tacking calculations also require your wind speed, which can be manually entered in the text box. 2. Then on the Bearing panel, you can select specify the waypoint you want (previously saved) by pressing the + beside Follow Route. That's it. 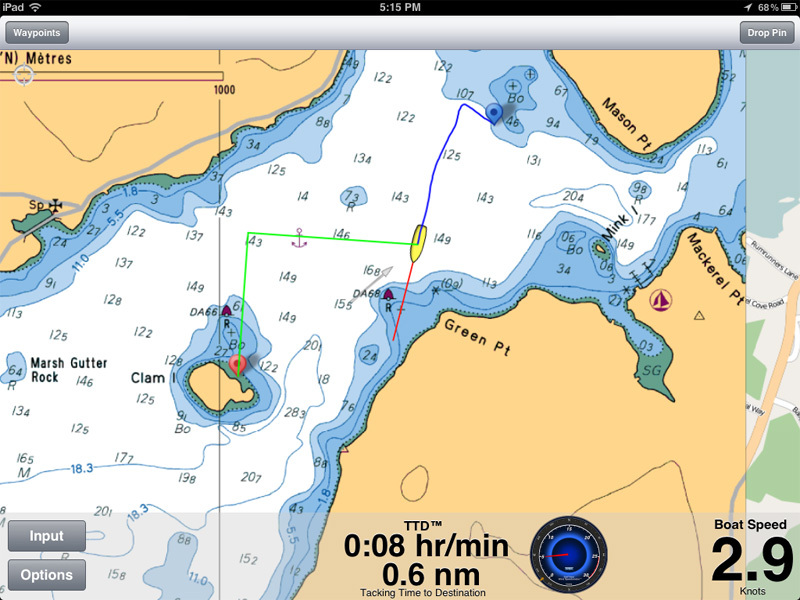 Now, as you sail, the optimal tacks and TTD to your next waypoint will be displayed and continually updated. If you prefer to see a video explanation of the above, here is a one-minute YouTube clip, showing how to easily display your tacking results. You can also get the exact distances on each tack with the SailTimer calculations, along with your optimal tacks and Tacking Time to Destination. 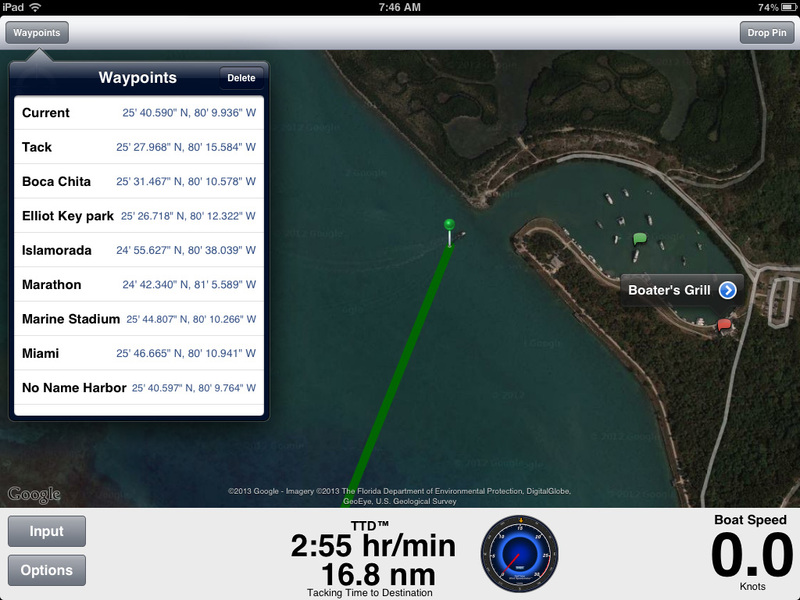 Just click on the red pin at the waypoint, to bring up the message box showing the heading, distance and duration on each tack. ActiveCaptain: This is like a real-time cruising guide, with crowd-sourced comments from other users. See reviews and comments about anchorages, marinas and hazards. A flag on the chart like the red and green flags in this screenshot shows the location of each Point of Interest. If you already have an ActiveCaptain account, you'll be able to log-in. Or, you can register a new account at ActiveCaptain.com and then use the same userid in the app. 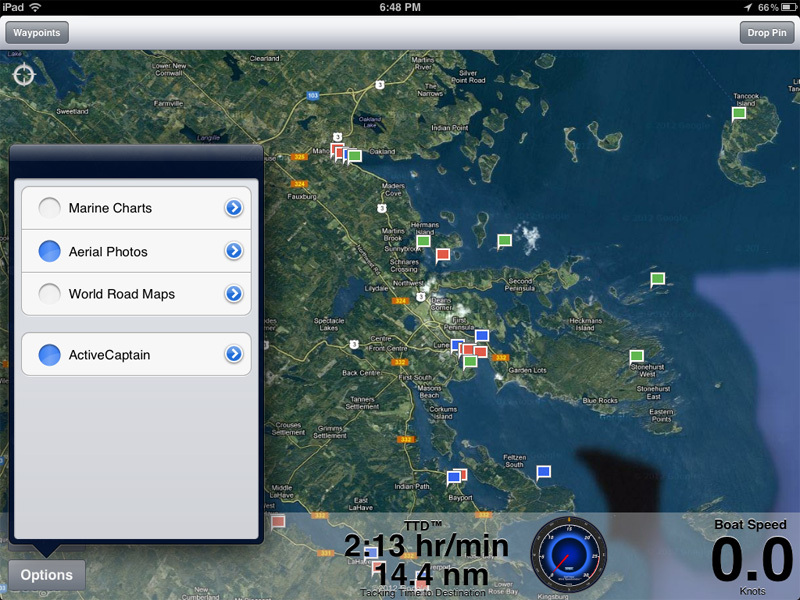 Once you do the in-app purchase (under Options - Charts - Marine Charts - Active Captain), just click on one of the flags and a panel will open with information about marinas, gas prices, customer ratings, hazards etc. The reviews from other boaters are especially helpful. 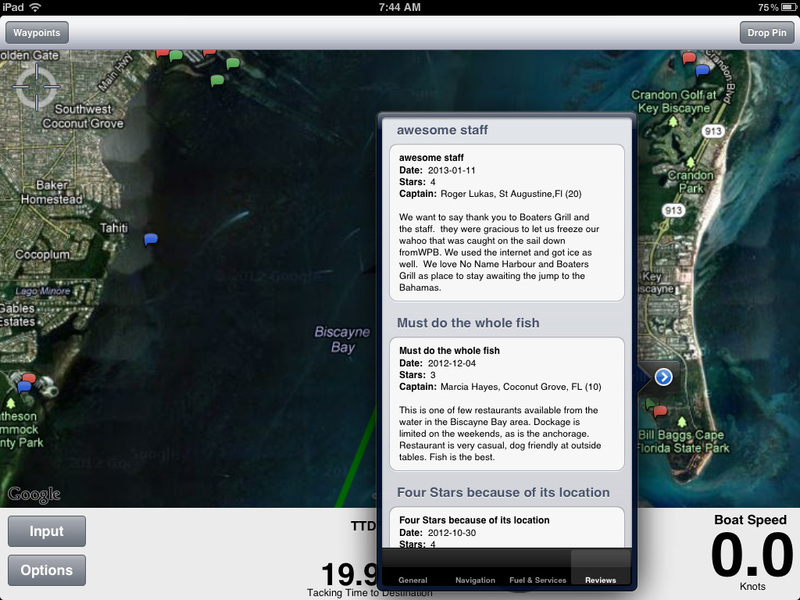 It is like a cruising guide that gets updated in real time. As you can see from the screenshot below, the Options Panel is also where you select the type of charts you wish to view. 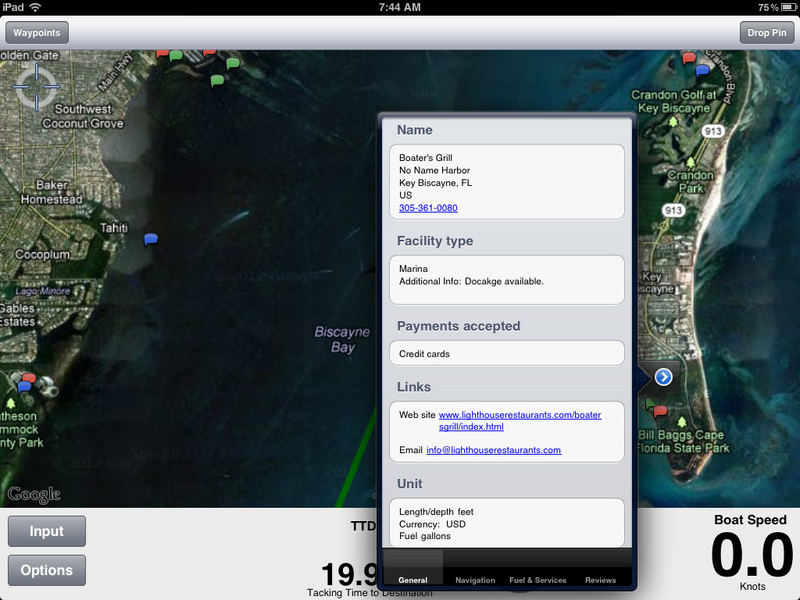 Worldwide aerial photos and land maps are included free. Either of these or marine charts can be used offline, although they need to be downloaded onto your iPad/iPhone while you still have an internet connection. 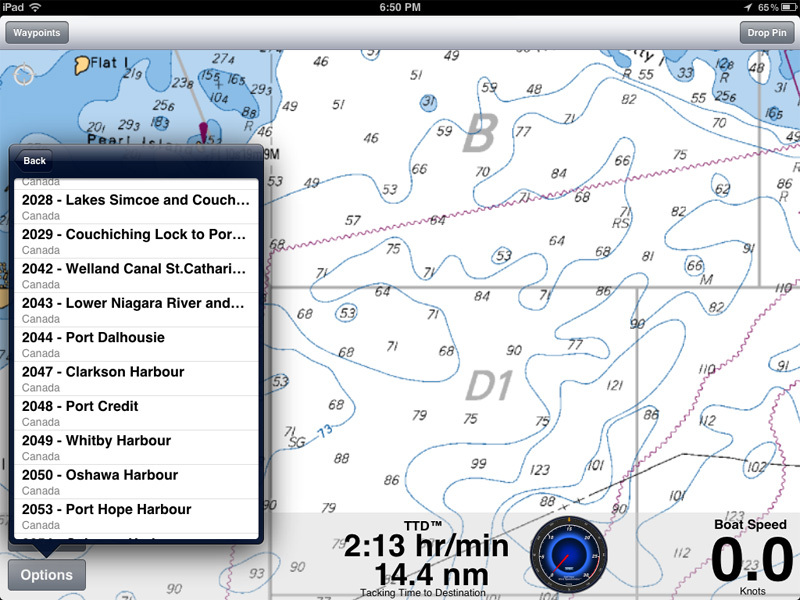 Nautical Charts: Select marine charts you need under the Options button in the lower left corner of the screen. 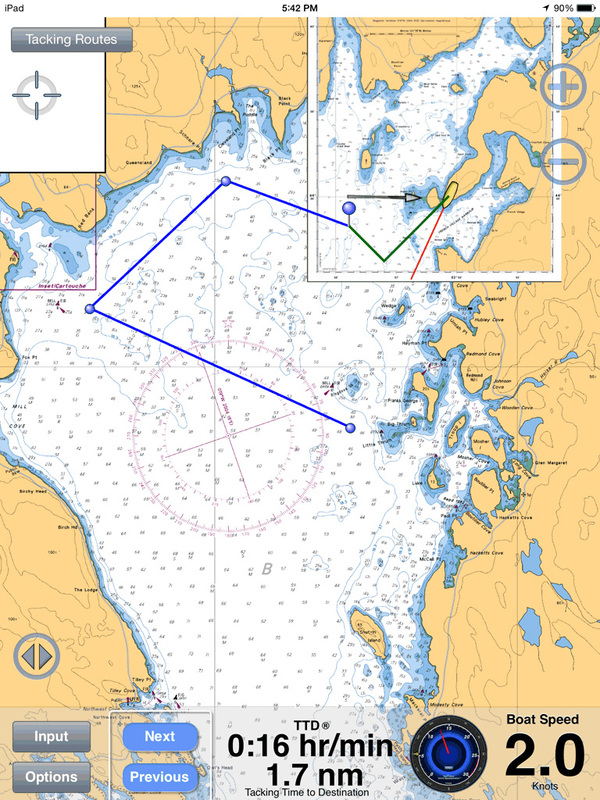 There is also an FAQ for optimal display of marine charts. The prices are far lower than traditional paper chart prices, and give you great value. For example, the NOAA charts for the USA Atlantic region cover from Maine to Florida down the ICW. US marine charts are available for the Pacific Coast, Gulf Coast, Great Lakes, Atlantic Coast, Alaska, and US Virgin Islands & Puerto Rico (including large-scale charts of The Bahamas). The screenshot below shows individual charts in Canada, although we now have region bundles in Canada too. In UK and New Zealand, the one in-app purchase gives you access to charts for the entire country. Under the Input button, the Set-Up panel is shown below. When you enter your boat's Length at Water Line, the app will display your boat's "hullspeed" (maximum speed, at least for keelboats). The SailTimer Wind Vane™ was the first anemometer in the world that could send wind speed and direction through the air to an iPad or iPhone, and we now have the next generation with the SailTimer Wind Instrument™. Obviously this is very useful for sailing. There are some controls for this in the Set-Up panel. Once you are receiving the wind data wirelessly, the app will automatically update your tacking results as the wind changes. You can also click the speedometer icon for a larger view of the wind speed and wind direction. You can leave this open while en route, so that you can see gusts while also watching your location and GPS track on the chart. There is also now a Wind Angle button in the upper right of the screen at all times. When you are moving, it displays the wind angle relative to the boat's heading, and also the wind speed. For racing, a countdown timer is also included. Large simple numbers are used for easy viewing. Copyright 2005-2017 (c) SailTimer Inc.